Production Time could take 10 working days. Rush jobs at higher prices are possible. Minimum orders are for a quantity of 6, and orders must be in multiples of 6. Production time is normally 10 working days. Quantity Discounts available for 12 or more, and especially for 24 or more. Contact us for volume savings. Spring Clips for high wind areas. Minimum 500 pieces @ $0.25 each. 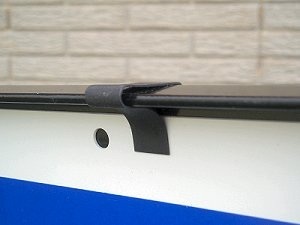 Easy to use clip accessory allows sign panels to be attached without nuts and bolts. Simply press the spring steel clip on to the frame for fast and secure panel assembly. For orders less than quantity of 5, please add $5 handling charge. Discounts on quantities of 12 or more. Buy yard signs and receive 5% to 10% discount on above products. We have more Realtor signs and frames. Real Estate Products Discount marketing prices all year long, serving the real estate housing and realtor community. 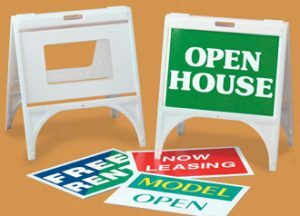 Check our special prices on discount real estate yard signs. 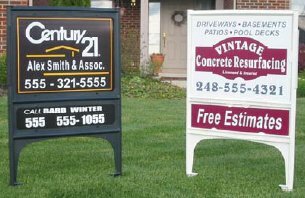 Extra discounts when buying other advertising products in addition to Realtor yard signs. Despite the recession, houses in the real estate market are selling. You can still find pockets of appreciation when the Real Estate house market has crashed. Honesty is the best policy and we follow the Golden Rule. Our goal is to provide you high quality real estate steel frames at reasonable discount prices. 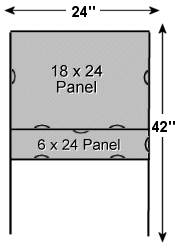 Top panel accepts a 18″ x 24″ sign and bottom panel accepts a 6″ x 24″ rider. Signs can slide in or bolt in. Order in multiples of 6 as they come in boxes of 6. 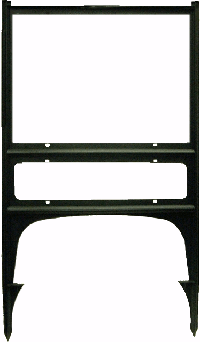 3/4″ Angle Iron Powder Coated Black. This is our best selling Steel Frame. We also have a Real Estate Sign Frame that holds signs 24×36. Prices are about 33% more than above. Minimum order is 50. Contact us for more details.